The medication component in NEXUS / HIS is a complete module for prescribing, checking, making available and monitoring administration of drugs prescribed for patients. This is performed with checking of interactions and contraindications. Medication is one of the processes involving the most responsibility in treating patients, and it is very important not just from a safety aspect. Ongoing changes in medication must be communicated between professional groups immediately, and prescriptions and administration forms must be unambiguous. This requires intuitive operability of the system and an easy-to-understand, unique interface. These are requirements, which NEXUS fulfills convincingly with the medication solution. NEXUS / HIS simplifies the medication processes throughout hospitals, from prescriptions to administration. The individual steps of medication are documented in line with your clinical processes; supplies are monitored and medication administered is booked when applicable. NEXUS / MEDICATION is used both at wards at prescription of medication as well as in intensive care units and outpatient clinics. Thanks to the comprehensive module, every prescription type can be issued easily and clearly arranged using one single interface. The software has been designed closely in line with doctors' working methods; as a result, special areas for repeated prescriptions for infusion therapy are provided as well treatment plans and prescriptions dependent on measurement values. Of special significance: NEXUS focus on optimum patient safety with integration of pharmaceutical drug safety modules such as checks for contraindications and interactions with other drugs. NEXUS / MEDICATION provides semi-automated support of the complete administration process from preparation to bar-coded administration and integration of blister and unit dose automated machines. Overviews related to patients and wards in the form of lists simplify provision of drugs to be administered. 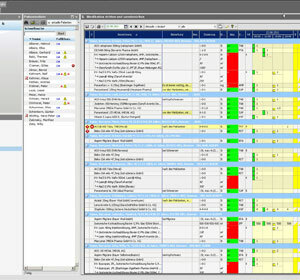 Documentation of medication administration is supported decisively for the nurses; administration of several drugs can be confirmed with one single click. NEXUS also focuses on process and patient safety in administration of drugs; each prescription must be authorised and every change historicised. With that, NEXUS / MEDICATION supports compliance with required safety regulations. Prescribed drugs and changes to prescriptions can be communicated to a blister or unit dose system to have the corresponding daily doses prepared. The objective: Preventing storage at wards and losses due to expiration of drug best-before dates. COURSE OF MEDICATION AND CURVE DISPLAY: Overview! 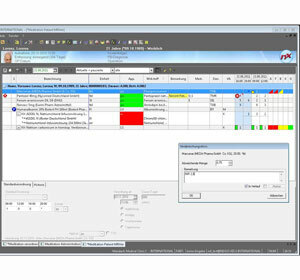 NEXUS also provides the complete medication process in an integrated patient chart. Drugs can be prescribed directly in the chart, administered or compared with vital parameters. For example, a glance at a blood pressure value at the administered dose of an antihypertensive agent. Consequently, the integrated patient chart becomes a central tool for the doctor's rounds at a ward for all professional groups involved. Both the doctors use the chart to obtain an overview or prescribe drugs and the nurses to record administration of drugs or vital parameters. This is a considerable help during a doctor's rounds.